John Deere has been manufacturing tractors for a century. 2018 will be filled with a series of events to celebrate production history. John Deere has kicked off a full year of events for 2018 in celebration of its 100th anniversary of tractor production. A Gold Key Tour for a Florida-based family and the delivery of the first 2018 tractor made in Waterloo, Iowa, marked the beginning of the series. Deere initially entered the farm tractor business back in March 1918. The company became a prominent business in the industry after it acquired the Waterloo Gasoline Engine Company. 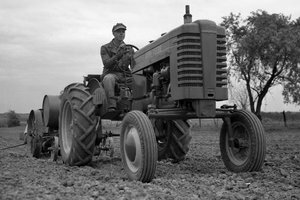 To mark 100 years of operation, the Smithsonian’s National Museum of American History will center the theme of the “American Enterprise” exhibition on the tractor. A green, yellow and red Waterloo Boy tractor will be placed at the entrance of the exhibition beginning in January 2018. In addition, a display on precision farming will be a part of the exhibit, where visitors will be able to learn about the use of the technology in today’s agricultural industry. Deere will donate a GPS antenna to the display for educational purposes. Some of Deere’s most iconic tractors will also be on display at the John Deere Tractor and Engine Museum, John Deere Pavilion, John Deere World Headquarters and John Deere Forum.